Now that the weather seems to be picking up (we hope!) it has been possible to convene our Monday working parties with more regularity, and steady progress has been maintained throughout the month. Tony's engineering team has been further strengthened by the arrival of Richard Fraser, who has lost no time getting his head round the contents of the Machine Shop and has been busy drilling frame stretchers. One of the smaller stretchers - which we removed for final drilling - has now been replaced between the frames, and all contact surfaces have been thoroughly cleaned and joints sealed. Tony continues to work with his colleagues on machining the stretchers still waiting to be fitted, and there will soon be a further concerted burst of bolting-on. The firebox support bracket - the only cast frame stretcher on the 82XXX (the others are fabrications) - is to be cast in April by Trefoil of Tinsley (Sheffield), and Tony took Brian Oldford's pattern for this to the Yorkshire company's foundry in the last week of March. 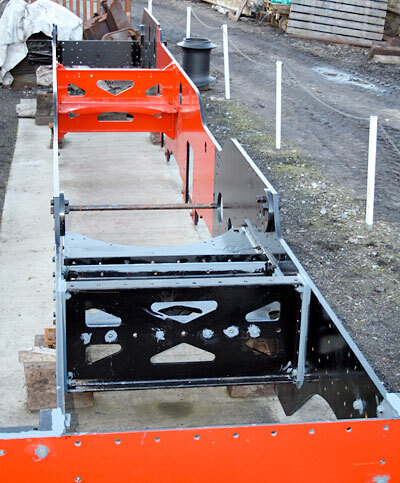 Also in Yorkshire, Dave Hewson has been contracted to fabricate the two stretchers that support the pony truck pivot centres. Tony and Chris plan to transport the profiled steel for these items to Dave's premises in Sheffield as soon as possible during April. On their return to Bridgnorth, they (the stretchers, not Tony and Chris!) will be bolted on to the frames and should look quite eye-catching. 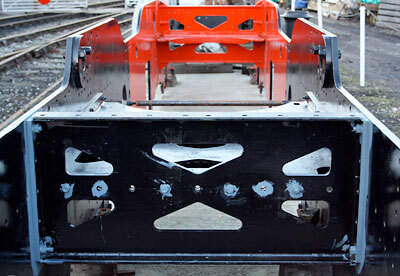 A considerable number of stiffening angle brackets have been cut and drilled during March, all as per the original BR specification, and these are now in the process of being fitted to the frames. We are well on course to complete the frame assembly this year, and are already starting to make plans to raise funds for the next major stage in the construction of 82045 - namely, the wheels. We estimate that we will need to raise over £100,000 for the driving wheel assemblies, involving the casting and machining of the wheels themselves and the machining and fitting of tyres and axles. A rough estimate of the cost of casting is £10,000 per wheel, and we hope to have sufficient finance in place to have this job done during 2011. (Brian's driving wheel pattern is, of course, already available and currently on temporary display in The Engine House). Thanks for your support, and thanks also to Roger Hart for initiating contact with the retailers. The teams have been busy at two major Galas of the year so far. At our home on the SVR in early March we were made welcome on Platform 2 at Bridgnorth where, thankfully the rain held off but the bitterly cold weather proved to be a trial, however, the close proximity of Stanier Mogul No.42968 made a welcome ' hand warmer'. The team at Kidderminster were more comfortable and sales were brisk at each end of the line with our new range of exclusive 82045 merchandise proving popular. Tony and Barbara went to the West Somerset Railway Spring Gala and were made very welcome. Once again sales were brisk and so was the wind which blows straight down the platform from the sea!!! Raffle tickets are selling very well. If you fancy a flutter (1st prize is a 32 mile footplate ride on the SVR) just send a sae. to Membership secretary, Barbara Massau. Tickets are £1each £5 per book. The draw is to take place at Bridgnorth on 23rd May 2010. And finally... don't forget that the first AGM of The 82045 Steam Locomotive Trust is to be held in the upstairs Library at Kidderminster Railway Museum on Saturday 10th April at 11.00. Another society has booked the room from 14.00, so we shan't detain you for too long! Please try and come along, as this promises to be an interesting meeting with a packed agenda. Two photos showing both vertical stretchers now in place. 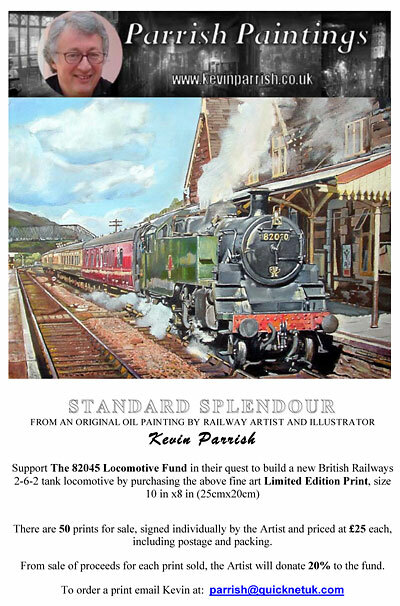 As mentioned in Steam Railway, Artist Kevin Parrish has limited edition prints of his 'Standard Splendour' in support of 82045. These can be ordered directly from Kevin Parrish. Click image to view larger PDF version.